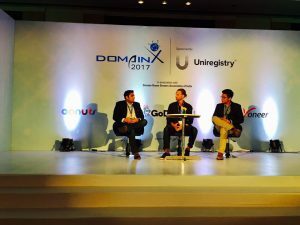 The DomainX domain name conference returned to the Shangri-La Eros Hotel in New Delhi, India, for the DomainX 2017 version – and fourth DomainX in India. 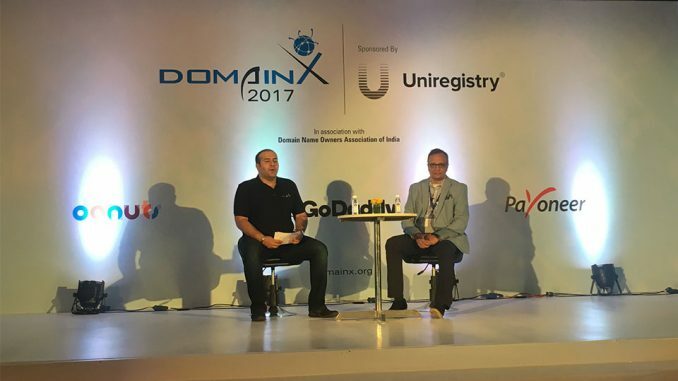 DomainX brings together India’s top domainers, bloggers and entrepreneurs, with international VIP guests representing some of the biggest domain-related companies and organisations in the world. The primary sponsor at DomainX 2017 was Uniregistry, and weekend activities included a Domainers vs. Bloggers cricket match on the Sunday. 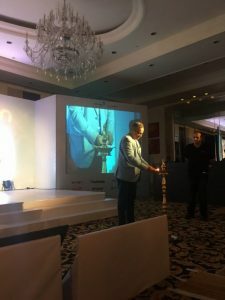 After the traditional candle lighting ceremony, the opening guest, Samiran Gupta of ICANN, asked the question, “What is the dot in domains?” He explained ICANN’s relevant to the Internet and the spectrum of domain names, while previewing the important October 11th DNSSEC key rollover, affecting the security of the entire Internet. Gupta also hinted that the next generation of the Web should shift dramatically towards increased use of International Domain Names (IDNs) and web programming in other languages, as the next 400m Internet users about to come online are not English speakers. Amrendra Mishra of Analyzed Media has sold over 6000 domain names in his career, and offered invaluable wisdom pertaining to domain sales and his highly successful procedures. He shared insights into his outreach email communications, including daily emails with his list of domains, and showed examples of his XLS spreadsheet files tracking keywords and analytics. Many of his domains are three word keywords, with the prefix “the” in front of strong keywords. Perhaps the most interesting aspect was Mishra’s approach to sourcing domain buyers. He researches and targets potential customers in specific niches, before finding suitable, relevant domains to match the niche. This results in higher percentages of sold domains, and less domains to renew; typically, he doesn’t renew domains when the year expires. This year’s legal panel was, perhaps, the most engaging I’ve witnessed in the domain law space. Guests included Zak Muskovitch from DNAttorney.com, Rodney D. Ryder from Scriboard.com, and Ankur Raheja of CyLaw.in. 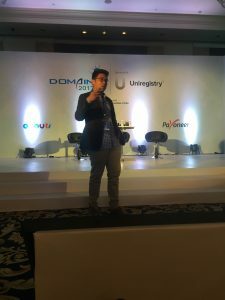 Their interactive session reviewed a selection of UDRP (Uniform Domain-Name Dispute-Resolution Policy) disputes, between domain registrants and trademark owners challenging the validity of the registration. For each case they asked the audience for votes on who they thought had won the case: the trademark holder or the respondent. Cases included Havells vs havellsindia.com, Google vs Groovle, Google vs Goggle & Oggle, Santa Fe vs santafepackersandmovers.com, Newshunt vs huntnews.com, M.S. Dhoni vs msdhoni.com, Nutrisystem vs nutrihealthsystems.com, and Croma vs croma.com. 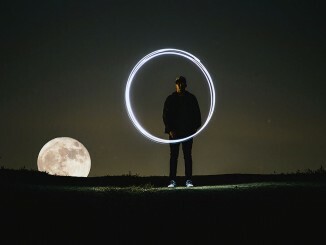 These cases were generally split for different reasons, including websites blatantly using trademark holder content, or branding too similar, respondents withdrawing, and even one settled by a business agreement that moved out of the scope of the UDRP. In another case, Virgin vs virginpvcpipe.com, the only reason the trademark holder won against a site that had nothing to do with anything of Virgin’s business, was because the respondent never responded due to inaccurate WHOIS contact information. This is a valuable lesson to all domain holders to keep WHOIS information updated. Shruti Kapoor of Payoneer presented information on her company’s convenient online payment solutions catered to domainers and websites with online stores. 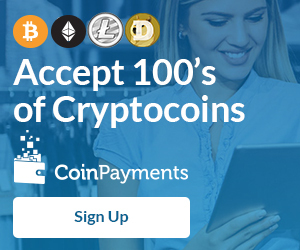 They support payments from over 200 countries, with variable rates depending on the transaction price, though have no plans to integrate cryptocurrency payments in their offerings. 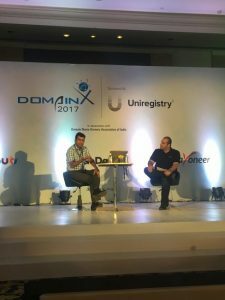 After lunch, DomainX streamed a Skype link up with top domainer Ali Zandi of Starfire Web Holdings. He was unable to attend due to health issues, but the live stream shared his mantra of ensuring clients acquired the domain they wanted as a priority – above anything else. He’ll also follow up weekly on domain enquiries to interested prospects, until they make the sale or tell him they are no longer interested. The enigmatic Australian, Troy Rushden of Namebrokers.com, unveiled an energetic presentation about his process for domain brokerage success. He puts the emphasis on recruiting agencies as his target customers, who in turn do the hard lifting by reaching out to their own client lists to facilitate more quantitative domain sales. He preached a process that includes accessing decision makers, effective communications, and communicating value. One nifty approach was how each of his domains featured beautiful, usable landing pages, and others that were developed to a point where they served as specific Internet resources, attracting organic traffic, and increasing revenue. Sanjeev Sharma of OpenSRS showcased some of his company’s offerings, with related products and services that cover websites, social properties, directories and email. 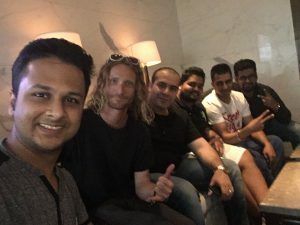 We learned that there are 3-4 new startups each day in India, which is one of the top venture capital countries in the world. He noted that aggregators should be viewed more of an opportunity than a threat. Sea Ansley of Mother.Domains hosted a panel called “The gTLD Confluence“. His guests included Justin Hutauruk from Uniregistry‘s Registrar division, and Anand Vora of Donuts. Vora shared some of the big recent gTLD sales in recent memory, including some considerable ROI. The trio discussed various aspects related to the new gTLDs, including stable gTLD renewal rates over the past 2 years that have compared favourably to legacy TLDs such as .com and .net in the same time period. 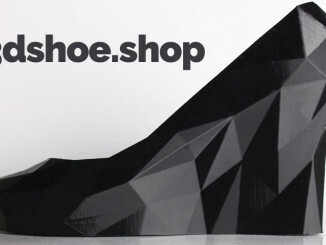 There was an emphasis on the power of quality domain names for brands and ideas, where domains have a responsibility to the Internet to be more of a resource than a bare “for sale” page that plagues so many otherwise useful domains. There was some criticism of the complicated approach to premium domain pricing policy, citing the recent .ART launch and their reservation of 1.2 million premium domains as poorly thought out for the end consumer. Finally, there was some insight into the next round of gTLD applications, which Samiran Gupta shared could be more of an open ended process over many coming years of the Internet instead of a small window reserved for applications. One hot tip from Vora – if you have a lot of domain names up for renewal, you can typically chat directly with your registrar and request a discount on bulk renewals. Registrars are generally pleased to keep you as their customers, and save you money in the process. Hutauruk closed the speaker line up by showcasing Uniregistry’s features and a list of his “Registrar Essentials” – including two-factor authentication, bulk import tools, registrar accreditation, mobility of registration and management, a marketplace for aftermarket domains, and a dedicated account manager. 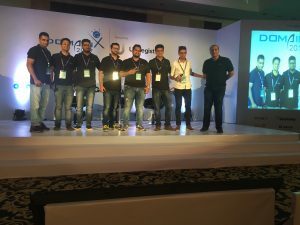 DomainX presented its 2016/2017 domainer awards to acknowledge the top domainers in India, and the session concluded with a big group photograph of everybody on stage. Later in the evening, there was a delicious VIP dinner and networking at a wonderful restaurant called Lodi – The Garden Restaurant. 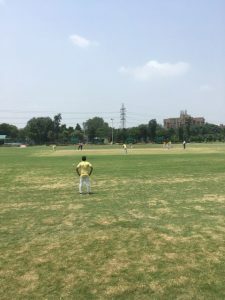 Sunday afternoon saw two teams of 11 take the excellent pitch at Rohini Sports Complex, for the epic cricket battle of Domainers vs. Bloggers. Domainers took off to an excellent start, highlighted by 43 runs off the bat of Navn Gupta, and an inspired 10 runs from StockPhoto.com‘s Jon Yau. Unfortunately, the pace slowed down towards the end, and the Domainers scored 122 runs off their 20 overs. The Domainers began to wilt in the extreme Delhi sun, and Bloggers went on a huge roll. Man of the Match Tahir scored 47 runs not out, with 25 runs chipped in from Prince, leading the Bloggers to win the game with 123 runs after only 13.4 overs. The day was a lot of fun and friendship, and includd a lot of highlights. Congratulations to all participants! 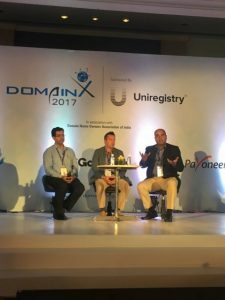 With the end of the cricket, DomainX 2017 was officially over, and was yet another major success by the Domain Name Owners Association of India. Well done to Manmeet, Gauruv and the DomainX 2017 team for all their hard work and efforts. 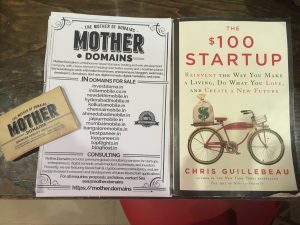 For 2018, Mother.Domains is planning to showcase a special, energetic presentation at DomainX. In the meantime, we are looking for interested domainers, bloggers, web developers, agencies, digital marketers and digital nomads to join our new India domains community. 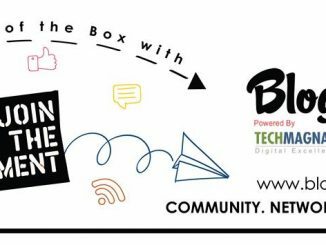 We have a Beta list of upcoming products and services catering to the Indian market, and a Facebook group focused on domain names and entrepreneurialism in India. 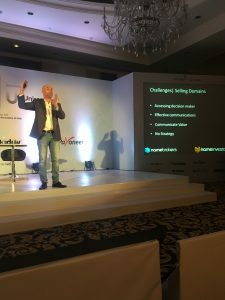 We’re extremely pleased to have participated in our third straight DomainX conference in India, and we are excited about being a growing part of the Indian domain and web community in the years to come. Want to join our India Beta? Check out our sign up page at india.mother.domains.